Real Madrid have been in marauding form this year when it comes to scoring goals. They have registered some big wins already this season and they recently hammered Rayo Vallecano 10-2 at the Santiago Bernabeu. Here are some of the biggest wins of Real Madrid through the course of their history. Real Madrid’s drubbing of Rayo Vallecano was an astounding result that left the Rayo manager Paco Jemez scratching his head and questioning some of the decisions of the referee that definitely impacted the eventual result. However, the record win still fell one goal short of Real Madrid’s record of the biggest win in the league. Los Blancos hammered Elche 11-2 in a league fixture at the Santiago Bernabeu in the 1959/60 season. The legendary Ferenc Puskas won the Pichichi that season courtesy of his 25 league goals, although Barcelona took home the title. Real Madrid registered their biggest Champions League win earlier this season when they put eight goals past a hapless Malmo at the Santiago Bernabeu. Cristiano Ronaldo grabbed four goals, while Karim Benzema scored a hat-trick of his own. Summer signing Mateo Kovacic’s goal completed the historic rout. The margin is tied with Liverpool’s 8-0 thrashing of Besiktas for the biggest win in the Champions League. Incidentally, Rafael Benitez was the manager of the winning side on both the occasions. However, the biggest European Cup for Los Blancos was their 9-0 win over Danish club B 1913 during the 1961/62 campaign. 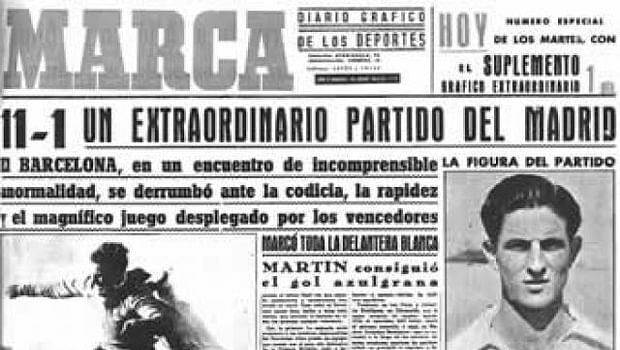 At the peak of General Franco’s oppressive regime, Real Madrid played host to fierce rivals Barcelona in a Copa del Generalisimo (that’s what the Copa del Rey was known under Franco’s dictatorship) fixture. Los Blancos trounced the Catalans 11-1. It remains the biggest result in the history of El Clasico. Although the result of that game is tainted by the reports of Franco’s men intimidating the Barcelona players and threatening them of dire consequences if they didn’t lose.